In 1838, Rev. 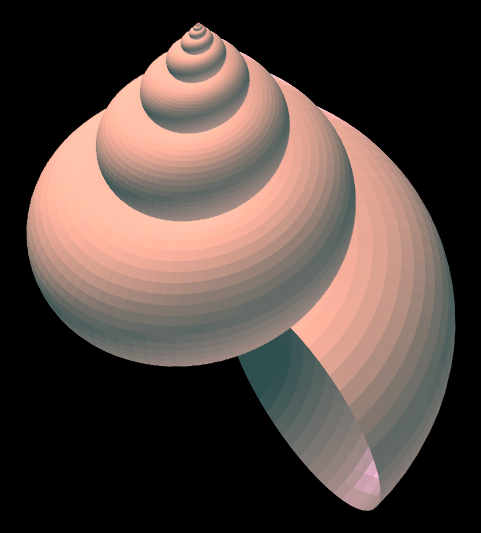 Henry Moseley discovered that a large number of mollusk shells and other shells can be described using three parameters: k, T, and D.
If T = 0 this is a logarithmic spiral in the (r, θ) plane. For positive T, the spiral is stretched so that its vertical position is proportional to its radius. Next we build a shell by putting a tube around this imaginary wire. The radius R of the tube at each point is proportional to the r coordinate: R = Dr. The image above was created using k = 0.1, T = 2.791, and D = 0.8845 using Øyvind Hammer’s seashell generating software. You can download Hammer’s software for Windows and experiment with your own shell simulations by adjusting the parameters. An interesting concept. Shell morphology is a major issue in paleontology, and one of the things that helped us establish the concept of morphospace. The interesting thing is that in any morphospace, much of the area is not filled by organisms–meaning that out of all possible configurations, organisms seem to select a small subset. It’s not clear why. Something like this may be helpful in figuring it out. Of course, being able to describe something and being able to make it are two different things, so maybe not. 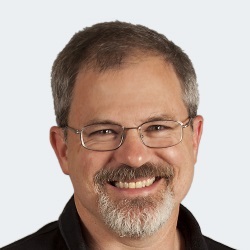 That’s the joy–and frustration–of this field! If you allow the cross-section of the tube to be an ellipse, by introducing another parameter D’ for the vertical axis, you can get oblong shells like clams and mussels.